Because like Pablo Picasso's paintings, Connor McDavid's on-ice craft is an art in itself. His latest display was nothing short of a masterpiece. A National Hockey League-leading 108-point year worthy of a second consecutive Art Ross Trophy, earning him praise and placing his name among hockey's great traditionalists. Of all those who have played in the NHL, only No. 97 and No. 99 have claimed the scoring title twice by 21 years old or younger. McDavid became the first player to win the award back-to-back since Jaromir Jagr did four times in a row from 1997-98 to 2000-01. His 84 even strength points are the most since the Ageless Wonder had 95 in 1995-96. The 41 goals and 108 points are numbers no Oilers player has reached in years. Not since Mark Messier compiled 129 points in 1989-90 and Petr Klima notched 40 goals in 1990-91. 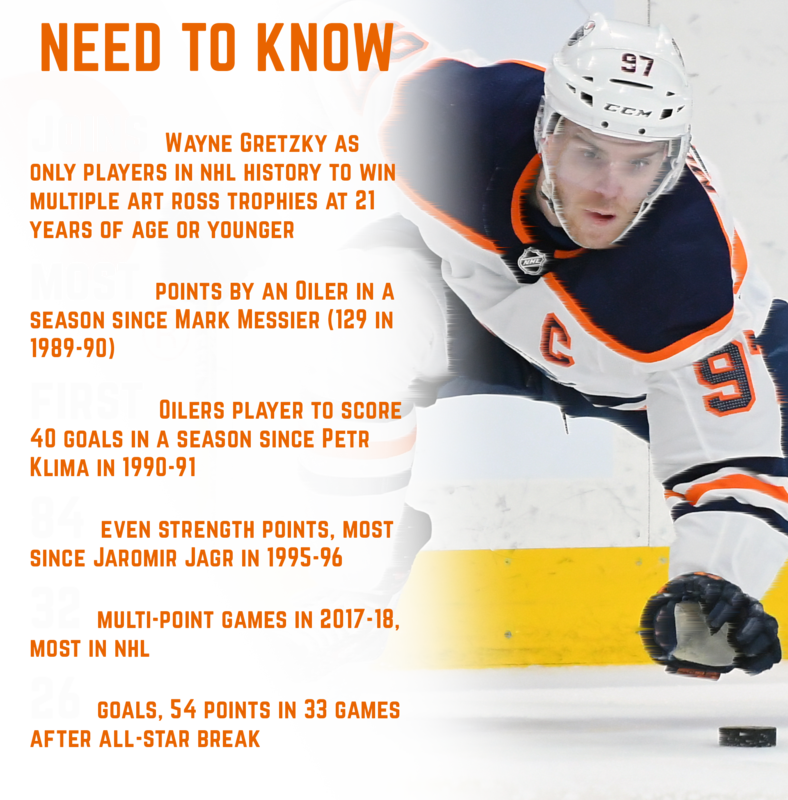 McDavid culled an incredible collection in 2017-18, manufacturing much of it with self-expression and creativity so genuine it, at times, brought principles of Realism into question. "I know you want answers," shrugged Oilers Head Coach Todd McLellan following McDavid's season-opening hat trick against the Calgary Flames. "But it's what he does." If there's art in hockey, then consider the Oilers Captain an avant-garde bending the game's complex with abstract displays daily. Rogers Place hosted galleries while the 21-year-old produced piece after piece on frozen white canvas. Should a curator ever gather items for McDavid's work of Art, it would have a range of exhibits. His Internet speed and unattainable top gear would be explored in the Essence of Motion Musée. Against the Flames on opening night, he blazed through all three zones to end up on a breakaway, tallying his second of the year. Several of his 67 assists - 39 primaries and 28 secondaries - would appear in the Archive of Apples. He showed control over his canvas with a panoramic view of the ice in the Windy City, fooling two Chicago Blackhawks defenders with a 360-degree backhand pass to give former Oiler Patrick Maroon a tap-in. Then there's the Flux Academy of Fine Hands, a deep-dive into his dangling. One can only feel for those victimized by the dizzying drag-and-twirls. Goaltenders left deked and confused, outstretched out front of their own crease in regulation or thereafter. Who said he didn't shoot? Project Snipe, the gallery of McDavid's goal scoring, is an exposé. A visual of his ability to ripple twine and sound goal horns by shooting with more fervor than ever before. Some goals represented early movements: Cubist was his bunt against the Colorado Avalanche on Feb. 1, when the play was broken and his body was splintered but he seemingly slowed time to bat in a fluttering puck. It was Dadaism four days later when an inconceivable angle became prime real estate as McDavid somehow placed the puck over goalie Andrei Vasilevskiy's shoulder. Bewildered viewers were left rationalizing the sequence's possibility. "I just feel bad for everyone that has to defend him," said defenceman Matt Benning. "He's so fast. He beats people with speed, with his smarts, his stickhandling. It's impressive and that's why he's the best or one of the best in the world." It has a Banksy-effect, McDavid's creativity. It perplexes audiences and like the enigmatic graffitist, McDavid prefers to operate in silence. Less is more, in terms of dialogue. He could talk all day about his '17-18 season feats: The League-leading 35 even-strength goals and 49 assists; 32 multi-point matches; 37 positive plus-minus outings; three hat tricks; and 1.32 points per game average, because many would ask. But art is show, not tell. "This game is all about confidence and how you're feeling out there," McDavid, a day after a five-point effort against the Lightning jumped him from 13th in League scoring to third, said. "At some point, you start feeling good and finding ways to produce." 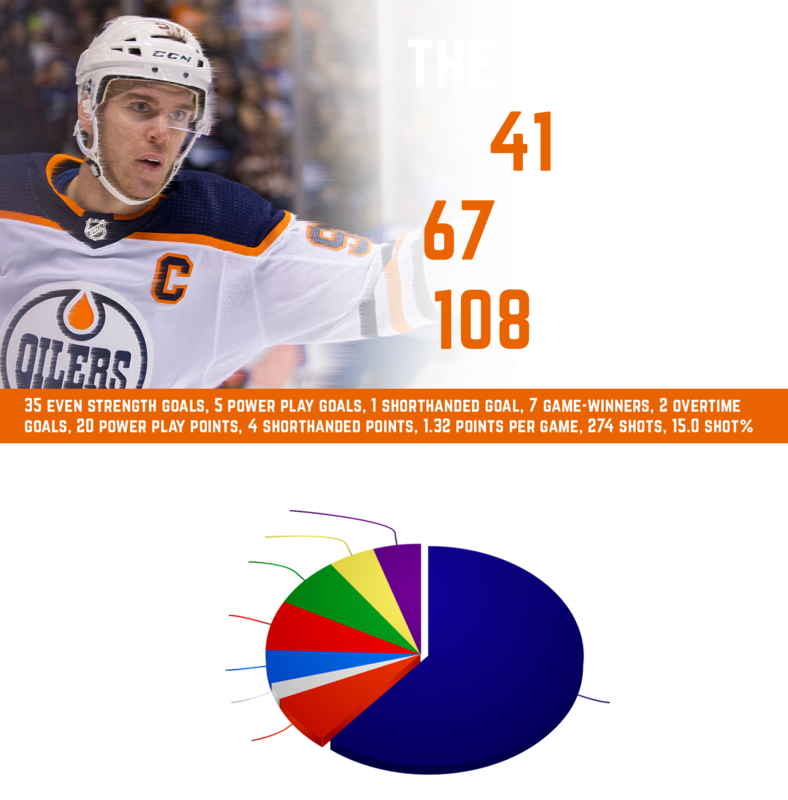 The season was carte blanche but a number of variants put the Oilers behind to start. Grand expectations followed 2016-17 after the franchise returned to the playoffs and accessed the second round, losing in Game 7 to the Anaheim Ducks. Injuries kept players out of the lineup or unable of performing to their potential, compounding the expectation effect. Then there was the illness that plagued McDavid in the Fall. Name the symptom and he most likely had it. A swollen throat, battering headaches and a loss of 15 pounds were enough to keep him sidelined but like the savant he is, durability prevailed. He didn't miss any of Edmonton's 82 games, doing so for a second straight campaign. "He had almost a month's worth of not playing at 100 percent," said McLellan at one point during the schedule. "Yet his numbers, his stats and his production are right where it was last year when he put up 100 points. The difference is where our team is at. "It doesn't fall solely on 97's shoulders. It falls on everybody's." The team blotched their start, coming out with a 3-6-1 October and an ensuing 7-8-1 record in November, putting them four games under .500 by December. A suffering immune system couldn't deter the young Oilers leader, who piled up 43 points in 36 games - with his individual turning point being the five-point showpiece on Feb. 5. "I definitely feel a lot better," the forward said post-game after Edmonton's 6-2 win over the Lightning. "I definitely didn't feel good when I was going through that little illness but I definitely feel better now." Early sketches weren't outlining the vision but there began a movement in the latter half of the season. McDavid navigated February with brushstrokes of beauty, scoring 13 goals and adding 8 assists for 21 points in just 14 games. With the urge to fire the puck more often, he'd shoot 58 on net in the month, owning a ridiculous 22.4 shooting percentage. "I don't really know what it is," he said when prodded. "Maybe a little bit of luck. The team's been playing better. All of that goes into it. If the team is playing well, individual success happens." When you thought there couldn't possibly be room for improvement, there was. In March, No. 97 struck 13 times in 16 games and finished with 28 points - his shooting percentage even better than the month before with a 24.5 percent clip. He'd overtake the scoring lead on March 24, in a two-goal performance against the Los Angeles Kings. Prior to that, Nikita Kucherov had paced the top of the leaderboard since Dec. 12. Add five more assists in three April games and the title was rightfully his. When the season was almost over he'd put his body of work into perspective. "That's really special," he said about joining Wayne Gretzky as the only two players to ever win the scoring title twice by the age of 21. "It's probably one of the things that I've done where I just kind of say, 'Wow.'" He'd continue to give all the praise to his teammates for the remarkable mural he made despite the down period. "I got my teammates to thank for everything," McDavid said. "They were helping me a lot down the stretch and doing everything they can." For every artist, there's always higher ground to reach. A new endeavour to tackle, new ideas to express and new pieces to create. That much is true after McDavid's latest work of art. "The individual stuff doesn't really matter. It's all about the team and that's what drives me. "That's what pushes me: To win."